Recently, the Korean wave is sweeping the Chinese box office. November saw For Love or Money starring JUNG Ji-hoon, The Boundary starring CHOO Ja-hyeon, Fiji 99°C Love starring JANG Woo-hyeok, and Bad Sister starring JI Jin-hee released side by side in China. In December Meet Miss Anxiety directed by KWAK Jae-yong who made My Sassy Girl was released, along with The Crossing starring SONG Hye-kyo, and there is also an upcoming release in January, 20 Once Again, a remake of the Korean film Miss Granny. Although the films were scheduled for release closed to each other, each production system was different. But “The basic rules of commercial films are the same,” said the director of Bad Sister KIM Tae-kyun. 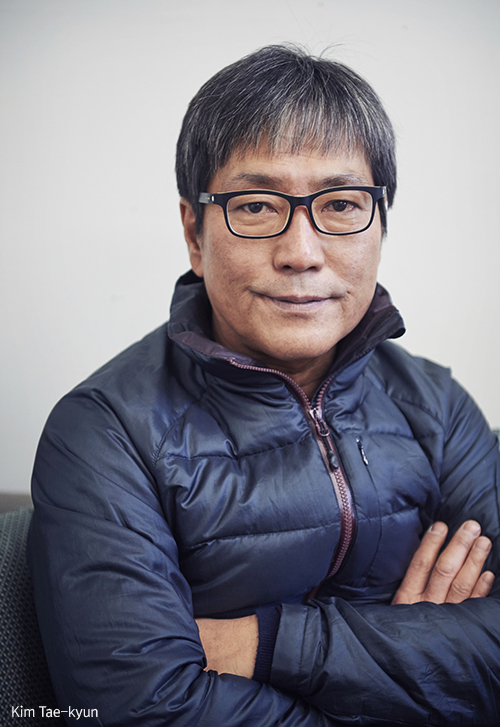 “Therefore, it’s applicable if we become used to the global production standards.” We had a chance to talk with director KIM who was involved in a Korea-China co-production project to hear about the trends in China. - Bad Sister starring JI Jin-hee and CHEN Yi-han premiered on November 28. Bad Sister is a romantic comedy where the lead actress (CHEN) plays an astrologer. One day, the astrologer receives a sudden call from her younger brother who flew into Busan to take a barista course. Her brother tells her that he will marry a much younger woman (Hye-rim, a former Wonder Girls member). Astrology tells her that the horoscopes of the couple do not agree. Moreover, it is bittersweet to see him leave home as she had taken care of her brother like her own son. She boards an airplane bound for Busan and bumps into a man (JI Jin-hee) and bickers with him. Later she finds out that he is the father of her brother’s bride-to-be. It’s a comedy with a bright and enjoyable message. - Recently, increasing number of Korean filmmakers and actors are taking part in Chinese films. Would you walk me through how you became involved on the project? This film is a work from East Sea Film Group and Glory Rich in China. Glory Rich planned the project. The other areas such as investment, production and distribution were taken care of by East Sea Film Group. They were looking for an overseas location under the working title of A Tale of Two Cities. Busan emerged as one of the contenders. A producer recommended me as a director who will manage their Korean location. At that time, I was engaging in the post-production work of Innocent Thing starring JANG Hyuk. Since Bad Sister was planned to be shot shortly in the summer, I accepted the offer. But when I came to doing it, the location shoot in Busan accounted for nearly 95% of the film. Since the film would be shot mostly in Korea, I decided to direct the film and organized a team consisting mostly of Korean staff members to work efficiency. Needless to say, several producers and actors were Chinese. To sum up, Bad Sister is a Chinese film. But its background and most of the staff members were from Korea. - Bad Sister is very different from Innocent Thing. What elements of the film attracted you? Shooting the film made me think about Adventures of Mrs. Park. I really enjoyed the work. In fact, I am a big fan of female lead characters in my films. In this film, the female character also takes the lead in the story. It’s the character’s charms that attracted me. - It seems that at first, the film targeted young Chinese women interested in the Korean cultural wave. Is this trend gradually expanding in China? Recently, many Chinese films have been shot abroad. They fly to various locations like Paris, Africa, Southeast Asia and the U.S. The Chinese government eased its control over foreign currency and its foreign currency reserves swelled. This change has encouraged filmmakers to leave China in search of good overseas locations. In addition, it is true that such films attract Chinese audiences. As successful romantic comedies can bring high returns, Chinese filmmakers prefer them. A good example is the popular Tiny Times series in China these days. Its first three parts were already released and the fourth part is preparing to be released. The three parts together earned a total of 1.2 billion yuan (21.24 billion won or US$190 million). Its story is similar to that of the TV drama Boys over Flowers. Tiny Times shows love, friendship and conspiracies among attractive people within high society in front of the backdrop of luxury sets. Many Chinese directors heaped criticism on the TV show, but the Tiny Times fever gripped young viewers. Five years ago, a film based on the internet novel 33 Days of Broken Heart became a huge hit. Chinese filmmakers learned a lesson then, which was not to judge a film by its artistic qualities. That brought a change to Chinese cinema. - Do you mean that the Chinese audiences are changing? No. Young audiences were mainstream all this time, but Chinese cinema had failed to provide them with what they wanted until now. In China, they say that those in their 20s go to movies eight times a month on average. As big cities expand, numerous young workers fulfill their fantasies in theaters. Not only do the theaters have great systems, they’re attached to entertaining facilities such as shopping malls. This kind of atmosphere is not limited to China, it is borderless. Urban consumerism is alike. This trend prompted a boom in production of highly profitable romantic comedies. Undoubtedly, they produce big-budget films too. But like us, when a big-budget film flops, they put a halt in making big-budget films for a while. There is not much difference in the workings of the Korean and Chinese film industries. - Why do you think the Chinese film industry wants to make films in partnership with Korean industry professionals? The Chinese film industry and cultural sector is facing a time of change. I expect that the Chinese film industry will not need Korean human resources for long. They will catch up with us within two to three years at longest and make films on their own. Once I lectured young film students at a prestigious film school. Their questions really impressed me. They still valued literature and art. It was time for them to step out of the line, but that was something they had trouble with. This is understandable when looking at the fact that China is a conservative nation of a one-party rule and because State Administration of Radio, Film and Television (SARFT) has the ultimate say in a film’s distribution. Even though on one side there are popular and liberal internet writers, they fail to become mainstream. But today, those in their late 30s and early 40s are taking the lead in the Chinese film industry and making money. Planning work belongs to those in their late 20s and early 30s. Those born in the 1980s are dominating in production and consumption of cultural products. China has been partnering with Korean filmmakers for about three years. Three years ago, I was offered a directing job but the project was dropped. Director KWAK Jae-yong flew into China five years ago and the film was finally released just a while ago. The Chinese film industry judged that they needed Korean filmmakers but was slow in putting their plans into action. Then they began working with Korean filmmakers on a full scale last year. Quite a number of people in shooting, lighting and production design are actively working with Chinese productions. Nowadays, it is not a challenge to come by Korean directors in Beijing. China has opened its film market in terms of human resources. Now, the issue is the capital market of Chinese cinema. China has not opened the capital market. They rejected Korea’s investment and will not sign to give performance-based bonuses to Korean directors. Even if the Korean investors sign on, they only allowed them to take rights for the region of Korea. But keeping rights only in Korea is meaningless. But now, they seem to think positively about allowing Korean investors to own their investment equities. This indicates that Chinese productions have become more capitalistic. Their joint production with Hong Kong and Taiwan increased and changed them. They recognized that investors cannot take all profits from films they invested in after seeing popular actors and directors demand incentives and equities. - A boom in Korea-China co-productions and the expansion of the Chinese market have led many Korean filmmakers to consider making a foray into China. Basically, investors and producers think alike whether films are produced in Korea or China. They strongly stick to rationalism and pragmatism. Equally important, China has multiplexes and a distribution system. This goes the same for nearly all countries. One week is long enough to determine the success or failure of a film. This means that in a sense, the Chinese film market is more extreme than the Korean film market. But the Chinese film industry differs from the Korean film industry in three ways. - Do you have a plan to release the film in Korea? The Chinese side asked me to seek ways to release the film in Korea. But I still do not know about that. The film was made to target the Chinese market in the first place. I do not think that the film with largely unknown cast will be able to hit 150 to 200 screens in Korea. Even films starring ZHANG Ziyi failed to draw many spectators in Korea. Sometimes, art films are released via IPTV or screened on a small number of screens. But Bad Sister is not an art film. Thus, I doubt this film will be distributed in Korea. This issue needs more time to think.